“Developed by Google, G Suite, formerly known as Google Apps, is a brand of Cloud computing, productivity and collaboration tools, software and products developed by Google”. G Suite included Gmail, Hangouts, Calendar, Google+, Drive for large file storage, Docs, Sheets, Slides, Forms and Sites for collaboration and other tools and options. GMAIL ACCOUNT- G suite will let your employees create Gmail account with your business domain name. This way it will be easier for you to handle various accounts and also in case an employee leaves, you’ll have the power to change the credentials so that you can prevent important information about your business from being leaked. Also, all the multiple emails can be accessed from one inbox. CALENDAR- Google Calendar will help you scheduling important reminders so you don’t miss out on any calls with clients, meetings, project reminders etc. G suite gives you the option to create multiple calendars that can be accessed by everyone in your company so that all of you can meet your deadlines and don’t miss out on any important events. GOOGLE DRIVE- With Google Drive you can save, access all of your files at one place. G Suite basic plan provides you with 30GB storage for every employee and unlimited storage for G Suite’s Business, Enterprise, and Teams. GOOGLE DOCS AND SHEETS- These everyday tools allow you to create and edit documents and spreadsheets for your business in your browser. These can be easily collaborated or shared with other individuals or companies and can be sent back and forth conveniently. They can be used when working with guest bloggers, getting feedbacks and comments from team members as they allow comment option, running quick financial figures, writing up content for paid sponsorship etc. GOOGLE KEEP- Create to-do lists, notes, set reminders with the Google Keep. These can be easily shared with your team and always get synced with your devices so they always stay with you no matter how many devices you change. ADMIN CONSOLE- Admin Console has made it easier for the business owners to control everything from one place. Add new users, groups, manage other devices, configure security settings etc. with Admin Console. OTHER TOOLS- Other useful tools such as Hangouts Chat, Hangout Meet, Google Forms, Google Slides, Google Sites, Mobile management make it easier for you interact with your employees and manage your work efficiently. Google is offering 20% off G Suite promo codes for countries like USA, UK, Australia, India, Brazil, Singapore and others that are eligible to avail the exciting offer. Sign in to your G Suite account and get 20% off promo code per user. Get 20% off G Suite promo codes for Basic and Business Plans one year Subscription. REMEMBER G SUITE PROMO CODES CAN ONLY BE USED DURING FIRST PAYMENT. THESE ARE ONLY FOR FIRST TIME REGISTRATION. 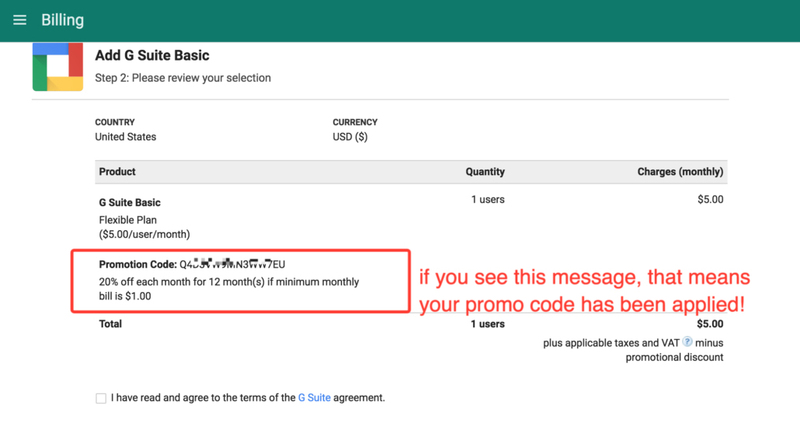 HOW CAN YOU USE THE PROMO CODES? Using the G Suite Promo Codes is quite easy. You just need to login to your G suite account and go to the Billing Setup, fill in the promo code in the Promotion Code box and continue. The discount amount will be shown up towards the end of the payment process. Use promo codes offered by partners. Higher discounts are available for bigger size companies but only 20% off is available until you cross 500 users. Make use of the 14 day trial period effectively with resellers and enterprise or premium resellers who can give you up to 90 days of trial.